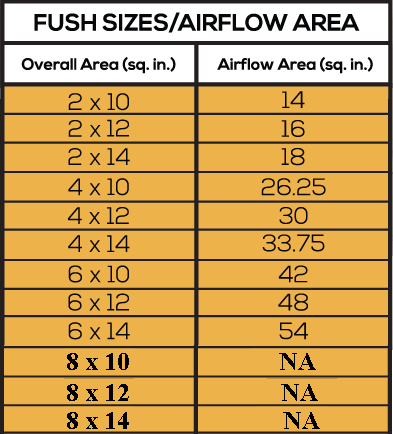 Our floor diffusers are made in the US and are crafted for floors that are 3/4" thick. 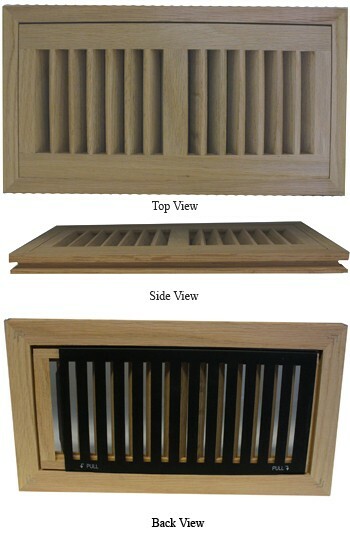 Because these are flush wood floor vents, the floor diffusers must be installed with new floors only. This is because the floor diffuser is made with a tongue and groove click system which will snap the vents into place with the new flooring. These flush wood floor vents are made out of red oak and are unfinished so they can be stained too match the flooring. The floor diffuser is made with a flat, steel damper insert which can easily be removed for cleaning purposes. The flush wood floor vents are made to diffuse air in two directions and distribute your airflow 30% better than regular flush mount vents. ***These sizes do not come with dampers. 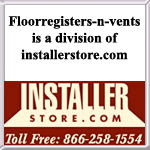 *For flush wood floor vents in another thickness, call us to ask about our 1/2" and 5/8" thick vents. Tip: To order the right floor diffuser, measure first the floor hole opening. Next you would order the closest size vent to that size. These can only be used in new floor installations. The flush wood floor vents come in other wood options and we also have drop in wood floor diffusers available for previously installed floors. Be sure to take a look at our full line of wood register options. Make a the right choice, these flush wood floor vents will leave you with a seamlessly neat hardwood, perfect for homes or offices.